Who is the Senior Partner, Group Account Director of MediaCom? What is the email of the Partner & Account Director - B2B Specialist of MediaCom? What is direct phone of the Senior Partner & Global Strategy Director of MediaCom? Who is the Media Buying, Media Planning agency of MediaCom? ​Update: In their Q4 earnings call, Office Depot CEO Gerry Smith said the company is rolling out BizBox in stores. Basically, BizBox is a way for small business owners to get on their feet with needed start-up components and marketing. Smith says they launched the flagship store redesigned for BizBox in January and it did really well. So, now they're working on a full-market pilot and want a national campaign to support it. He states it will include digital, broadcast and outdoor all centered around the local business community. So, sellers with high reach among local business communities (small business decision makers) should be able to secure revenue. (There should also be some spend still available for their mom demographic.) Historically, their top spending periods have been Q1 and Q3. pull their ads from Laura Ingraham's Fox News show after some questionable tweets. Nothing was spent on national TV in the same time frame of 2017, and full 2017 spend was $17.4 million. Pathmatics reports a YTD digital spend of $1.4 million, up $325,000 from the same time period of 2017. Full 2017 spend was $2.2 million. Top ad destinations this year include yahoo.com, retailmenot.com, answers.com, aol.com and slickdeals.net. I would expect the digital numbers to increase even further this year, by the way, sellers. Smith also mentioned in the earnings call that they are focusing more on digital because of the better ROI. Their other large spending channels include print and radio. Print stayed about the same YOY during Q1-Q3, but radio went up by about $4 million (per Kantar). Remember, Office Depot just completed its reviews and has named Y&R as its creative AOR. Read about the rest of their recent spend below. Sellers with a mom- and business decision maker (BDM) focus should have the advantage securing revenue here. Read more about OD's marketing spend below. Note that since the start of the year, the retailer has spent $8.8 million on six national TV ads, all of which have debuted in 2018. Note that during the same period last year, iSpot does not report any spend for OD. See chart for 2018 show targeting so far. AgencySpy, but it is unclear how far into the review process the company is, meaning there is still a slight chance you could get in. A company spokesperson told the site: "I can share with you that we are in the midst of a transformation, so we've made the decision to evaluate all of our agency partners." The transformation includes the arrival of a few new execs this year, such as adding here). Agency and martech readers - we placed OD in "Account in Jeopardy" territory in September, so hopefully you were able to engage marketing decision makers and get in on the review. Zimmerman handled creative and media for OD, but look for other work to also be under review, such as digital and PR. Sellers - Zimmerman launched its first work for OD this past summer, so be looking for a campaign to launch around the same time in 2018 (just in time for back-to-school season). According to Get more information on this spend here.Compare this spend with 2016's, when OD spent $1.5 million (Q1/Q4 being the highest spend periods). 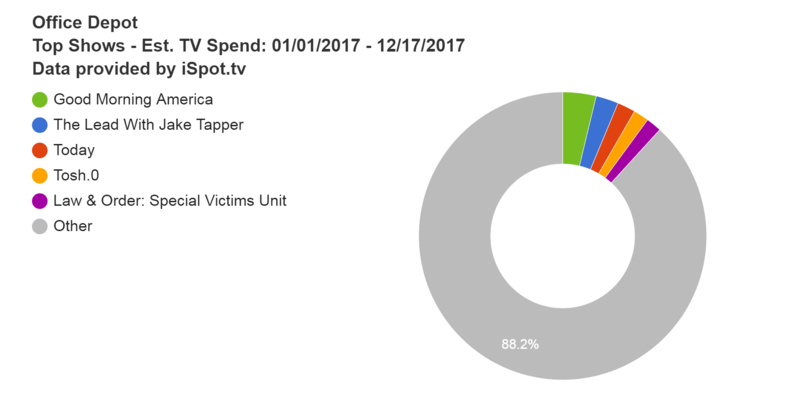 For national TV, iSpot reports that OD has spent $17.4 million this year - all of which was spent during BTS (late June through early September). See chart for show targeting. This is roughly a 50% reduction in TV spend, sellers, as 2016 saw the company spent $33.4 million. For 2016, OD has two main flight periods: BTS plus Q1. Since the company is in the midst of a review, I would look past Q1 2018 for dollars and focus on BTS for the coming year. Sellers with a mom- and business-focus should have the advantage securing revenue here.